Encounters has enabled the temporary return of Australian Indigenous cultural artefacts collected at the time of colonisation and held by the British Museum. Project partners include the National Museum of Australia, the British Museum, the Australian National University and a range of Aboriginal and Torres Strait Islander communities across Australia. The exhibition was developed around key themes: the historic objects from the British Museum; the encounter and connection to place/country; and contemporary community voice/dialogue with the object. These inform the layout, form and rhythm of the exhibition over 850sqm of temporary exhibition space. The core ‘encounters’ are presented in displays that use relationships to place as a key identifier. A large mural or projection of the landscape is employed as an initial feature. Each ‘encounter’ surrounds the object from the British Museum, as a contemporary conversation and response to the historic object. The unfolding story of these ‘encounter’ modules surround a central sculptural feature in the gallery space that takes the form of a giant woven fish trap. 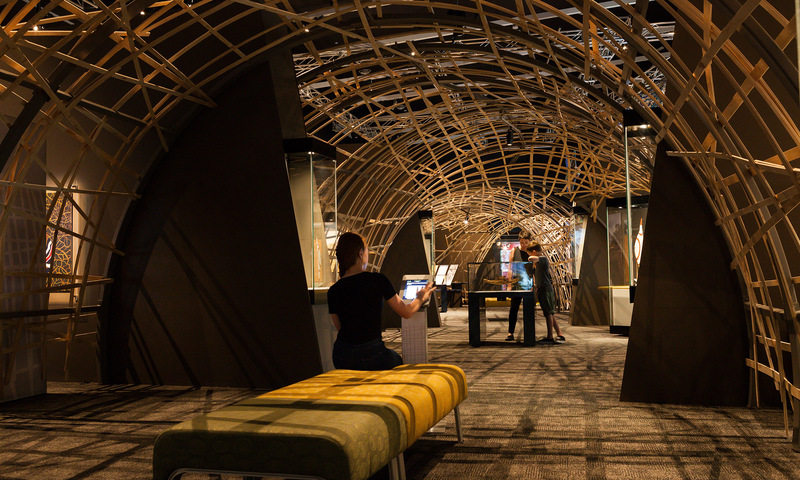 The trap form is 30 metres long and 3.6 metres high covered in an open lattice of plywood and runs through the centre of the exhibition space. Openings in the form allow visitors to enter the fish trap at various points through the exhibition. The fish trap feature is a response to the exhibition’s content, which for many will be a culturally significant and emotional experience. It is a calm enclosed space, in contrast to the active open space surrounding it. This design facilitates a unique contemporary conversation, about museums, indigenous culture and our shared history. The design facilitates an engagement and understanding of these complex issues and allows for a considered respectful response. The fish trap feature was made from plantation hoop pine and recyclable steel. All joinery was constructed of environmentally friendly MDF. The exhibition was designed to be easy to disassemble and the system showcases were designed for future reuse at the museum. The carbon footprint of the exhibition was reduced through local fabrication and locally sourced materials where possible.